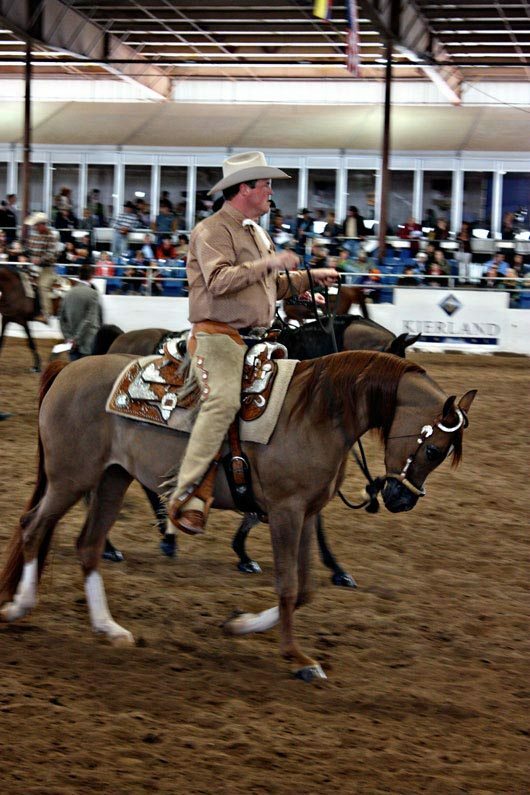 Jim Greendyk operates West Coast Training and Horsemanship – a full-service equine program, offering reining, cow horse, and horsemanship clinics and training. 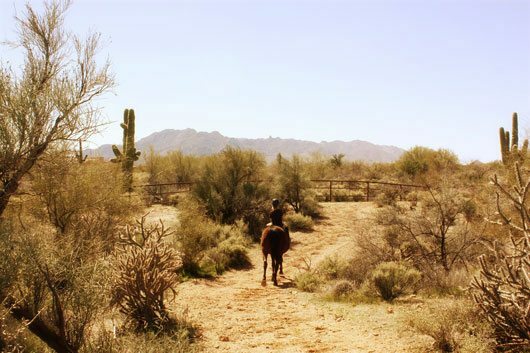 Along with a handful of his clients, Jim’s been travelling to the Scottsdale Arabian Horse Show for several years now, showing his part-bred and full-bred Arabian horses, and enjoying a bit of the “road-to” scenery on the way. 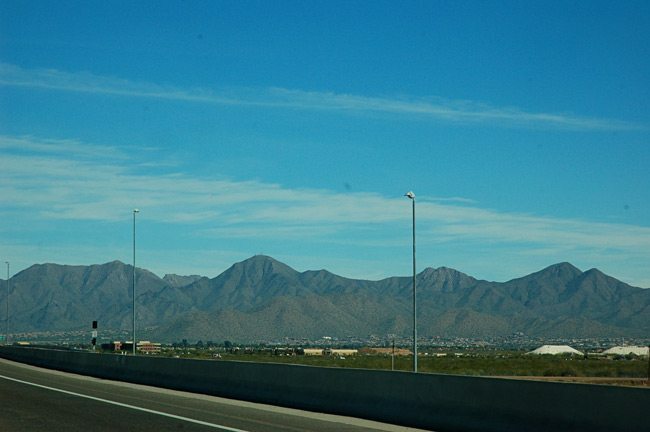 I caught up with Jim earlier in the year to ask him about his route for our Road to Arizona piece in the Jan/Feb Snowbirds Guide to Riding in Arizona feature, wherein we featured three possible routes to the state from various take-off points in Canada. I kicked it off last week with a familiar route for Albertans. Here is Jim’s route, along with a few tips from the well-travelled horseman. 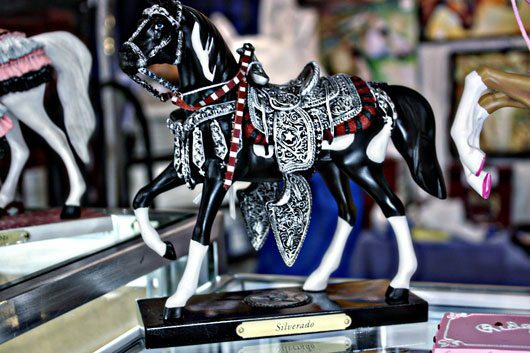 By the way, this year’s edition of the Scottsdale Arabian Horse Show – its 59th edition – runs Feb. 13-23. Believe me, you don’t have to have an Arabian in your barn to love this show. If you’re in the state, be sure to make it a part of your plans. 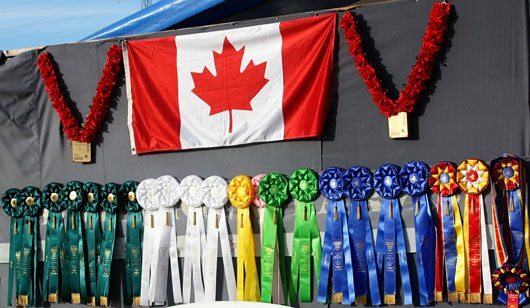 If not look for Jim and other Canadian riders through Iequine’s excellent feed of the show. 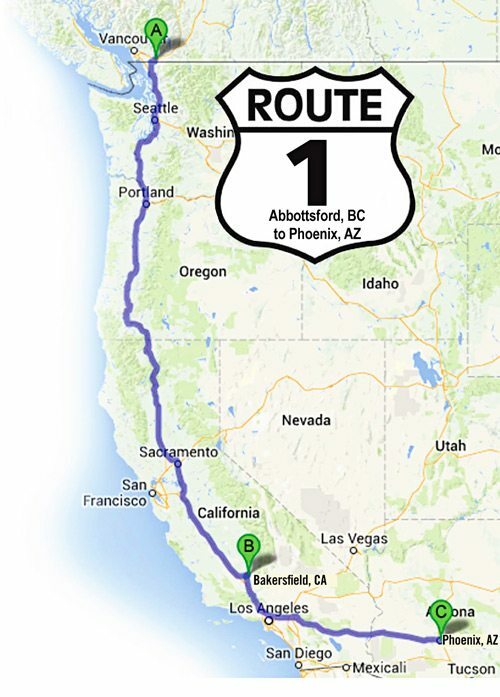 Abbottsford, BC to Phoenix, AZ, with an overnight in Bakersfield, CA. Road Conditions: Interstate all the way. It seldom happens but occasionally the Siskiyou Mountain Range Pass may close for snow, in which case be prepared to stop in Medford, or Yreka, Oregon. • Try not to hit the Siskiyou – the mountain range between southern Oregon and northern California at night. • If a nearly 18 hour drive is more than you’re hankering for in one leg, plan for a two night overnight – one night in Medford, Oregon (fairgrounds will stall overnight), then Bakersfield the second night. Besides the easier drive, you’ll land a stunning view of Mount Shasta on the morning of day two, just past Yreka, CA. 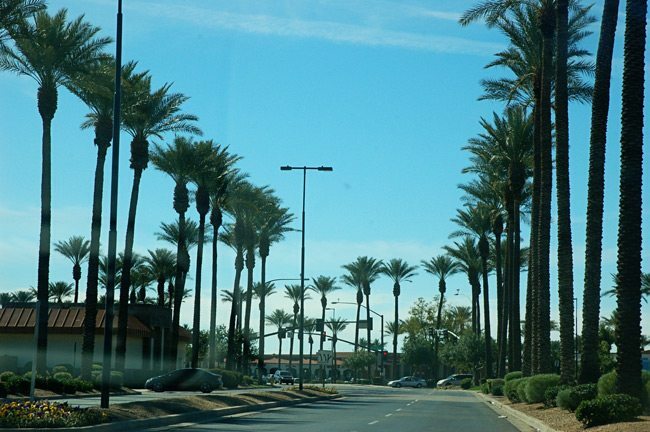 • Fuel up before the Mojave Desert and drive the speed limit in California. 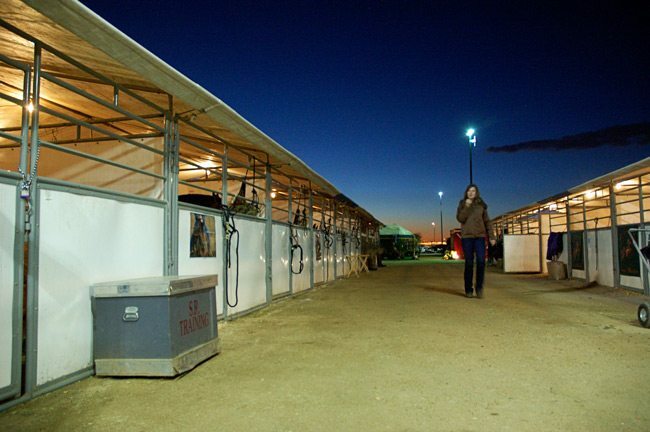 To Stay: The Bakersfield Fairgrounds offers overnight stabling. 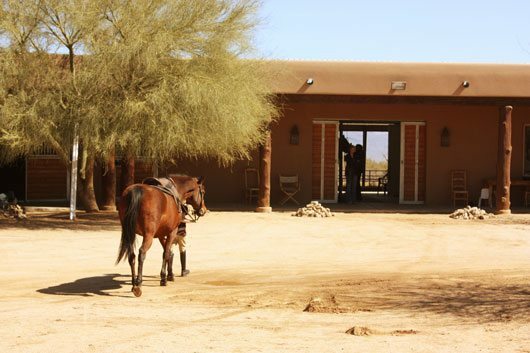 Find the Triple C Ranch Horse Hotel on Facebook or (661) 845-6937. 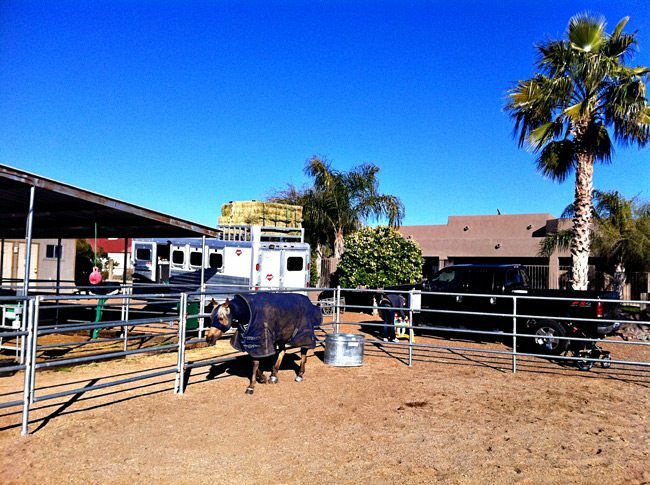 They offer indoor box stalls, indoor and outdoor arenas, alfalfa for sale, parking and hook-ups for big rigs and campers. Close to motels. To Do: Visit Buck Owen’s Crystal Palace and Museum – a combination theater/museum housing memorabilia spanning Buck Owens’ 40 year career in country music. See what’s playing at the Fox Theatre, an historical 1930’s theatre with extraordinaire acoustics in an intimate setting. Food & Drink: Named “Best Basque Food Restaurant of 2013” stop by the Wool Growers Restaurant where pickled tongue is the house specialty. After a long haul, a margarita is in order – enjoy Mexican food and drink at Mexicali. Fill up with a good breakfast before hitting the last leg of your trip at the local favorite – 24th Street Cafe. 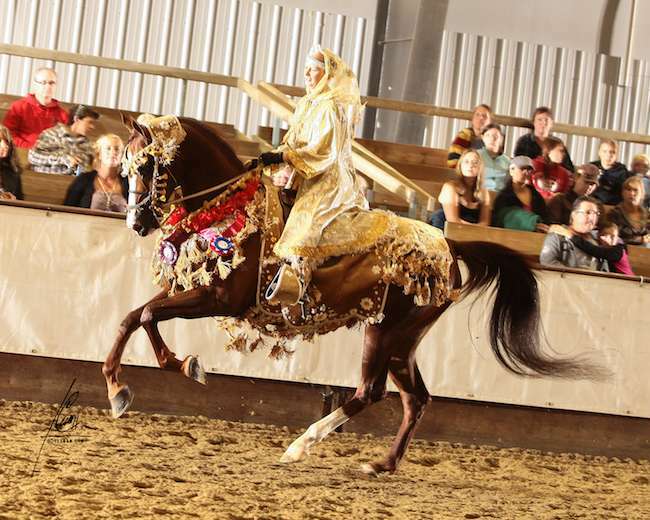 Arabian Horse Association Region 17 Championship covers every aspect of Arabian horse use and competition, from reining to English Pleasure, and Western to Arabic dress. Photo by Tex Cam. 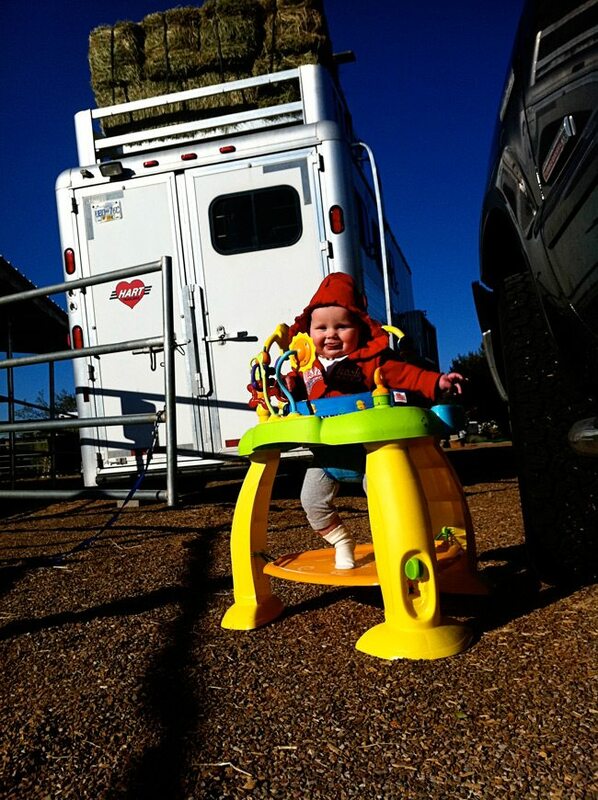 For year-round excitement, just add horsepower! The Calgary Stampede is thrilled to welcome four major horse events to their new home, the nearly-constructed Agrium Western Event Centre. 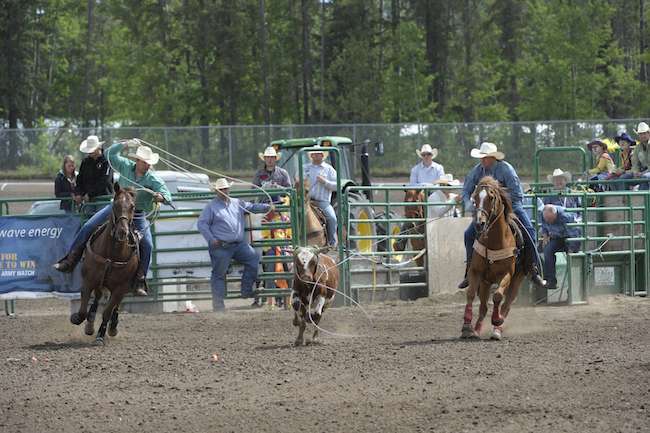 Each event will draw new participants and visitors to the heart of Calgary from across Western Canada to enjoy top horses and riders in action. Collectively, the events will add to the reputation of Stampede Park as a year-round gathering place. Jordan Dodds and Heeler Clark McCarroll team up to showcase the fast-paced sport of team roping in the summer of 2013. 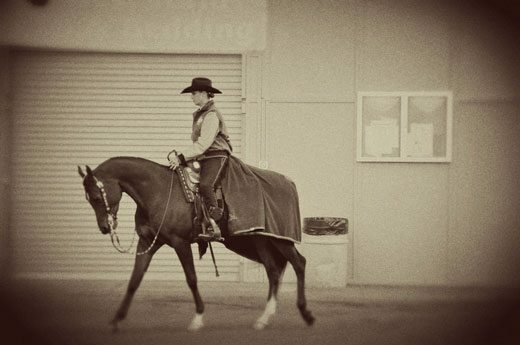 Photo by Mike Copeman, courtesy of Calgary Stampede. Agriculture is at the heart of the Calgary Stampede and the expansion activities underway with the Agrium Western Event Centre will provide a new focal point for agricultural events on Stampede Park. One of the largest projects in our 100-year history, the Agrium Western Event Centre is a state-of-the-art facility for western events and agriculture education, exhibition and industry in southern Alberta. Designed to form a lasting connection between urban and rural communities, it will host an engaging, globally-focused educational program called Journey 2050, and it will play a central role in making the Calgary Stampede a year-round gathering place. The Agrium Western Event Centre will be the new home for agricultural events on Stampede Park, hosting both regional and international competition, convention rodeos, and trade shows. The facility will include a 250’x150′ ft. show floor and 31,250 sq. ft. of clear-span space. It will also feature a 20,000 sq. ft. multipurpose hall, designed for competition, warm-up, trade shows, or exhibitions, as well as a magnificent 8,000 sq. ft. rotunda and entranceway. 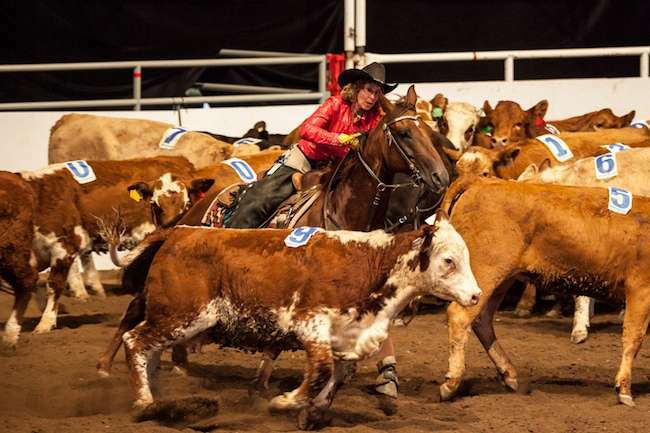 Cattle Penning National Championships are returning to downtown Calgary each October at the nearly-completed Agrium Western Event Centre at Stampede Park. Photo courtesy of Calgary Stampede. Scheduled for completion before the 2014 10-day Stampede, the Agrium Western Event Centre will be an important milestone in the Calgary Stampede’s vision of becoming a world-class, year-round gathering place. The key sponsor, Agrium, along with the governments of Alberta and Canada, has been instrumental in helping the Stampede elevate its agriculture and outreach programs by creating this world-class facility. Education will play a pivotal role in the legacy of the Agrium Western Event Centre. The building’s rotunda will be the home of the Journey 2050 program – an inquiry-based educational experience for Calgary-and-area middle school children. This world-class program will challenge students to sustainably feed the world’s nine billion people by 2050 in a fun and interactive way. 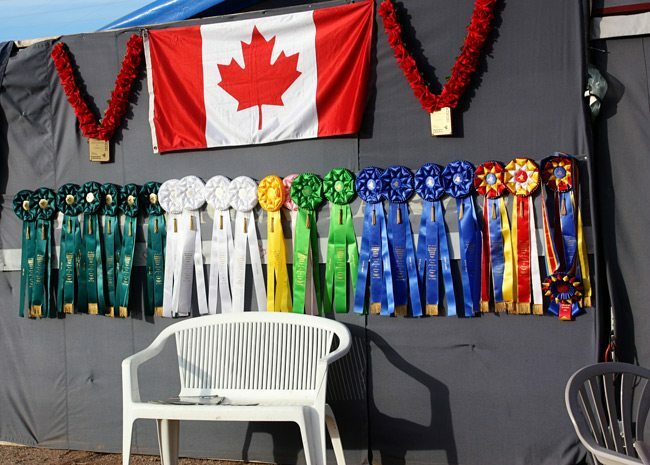 Show jumping returns to the heart of Calgary after a 30-year absence. 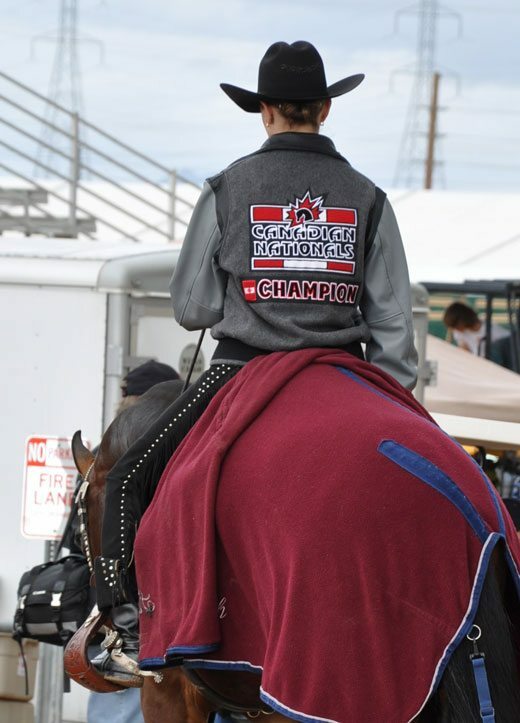 Photo courtesy of Rocky Mountain Show Jumping. One of the most ambitious capital projects in the Stampede’s history, the Agrium Western Event Centre is an ultra-modern centerpiece for western events and agriculture education, exhibition and industry in southern Alberta. Slated to open in June of 2014, it is unique in Canada, creating 150,000 square feet of dedicated livestock-friendly space. The building’s key sponsor, Agrium, along with the governments of Alberta and Canada, has been instrumental in helping the Stampede elevate its agriculture and outreach programs by creating this world-class facility. 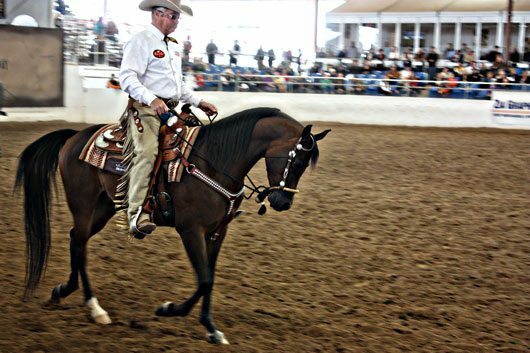 The unique features of the Agrium Western Event Centre convinced John Anderson of Rocky Mountain Show Jumping that Calgary is the right location for his show. Anderson is launching an all-new, ambitious 10-day show jumping and horse extravaganza in late October of 2014, called Royal West. 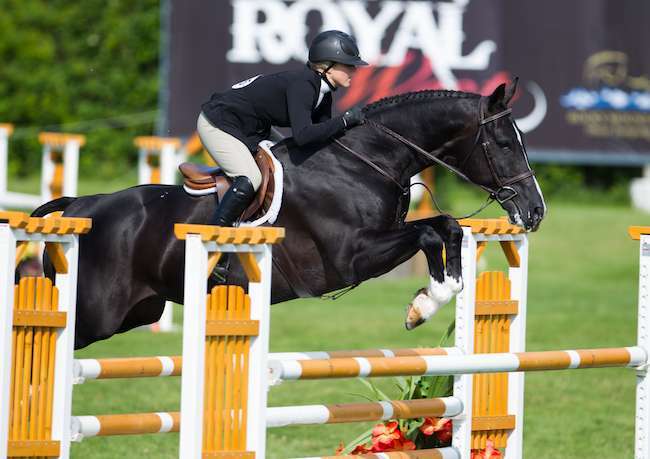 Designed to provide Western Canadian show jumpers a prelude or alternative to the Toronto-based Royal Show, Royal West will showcase hunter-jumper classes plus a full spectrum of other events such as barrel racing, heavy horse shows and terrier racing. “I’ve always wanted to do something like this. 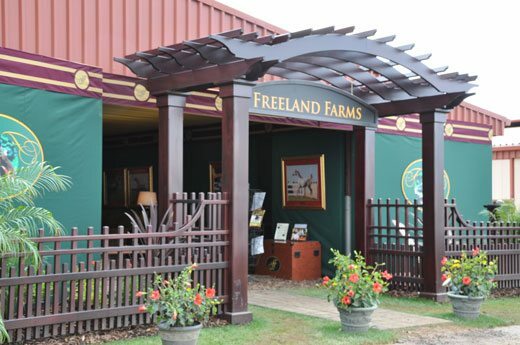 Now this large arena and all the dedicated facilities make it possible,” says Anderson, who explains show jumping requires more space than standard arenas would provide, with careful attention to proper footing and warm-up areas. Size and specialized facilities drew the Canadian Team Cattle Penning Association back to the Stampede after several years in other venues. Their championships finals draw up to 1,200 team entries with many as 2,500 spectators in the stands. Art Gallais, manager of Team Roping Canada, likens the Agrium Western Event Centre to the top facilities in Las Vegas where the world roping series are held. He says the building design is not only ideal for smooth operation of his event, but he adds the open concourse and VIP suites in the arena allows for valuable sponsorship exposure and experiences, which will help attract more sponsors to grow Team Roping Canada’s National Finals. As we enter our second century, the Calgary Stampede celebrates the people, the animals, the land, the traditions and the values that make up the unique spirit of the west. The Calgary Stampede contributes to the quality of life in Calgary and southern Alberta through our world-renowned 10-day Stampede, year-round facilities, western events and several youth and agriculture programs. Exemplifying the theme: We’re Greatest Together, we are a volunteer-supported, not-for-profit community organization that preserves and promotes western heritage and values. All revenue is reinvested into Calgary Stampede programs and facilities. 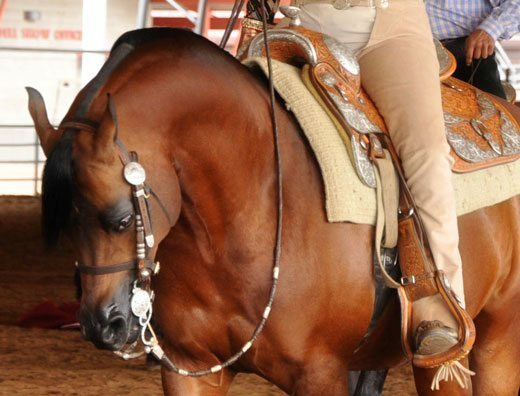 By far one of the most prominent horse events in February is the Scottsdale Arabian Horse Show & Shopping Expo, beginning February 14 and running through to February 24. 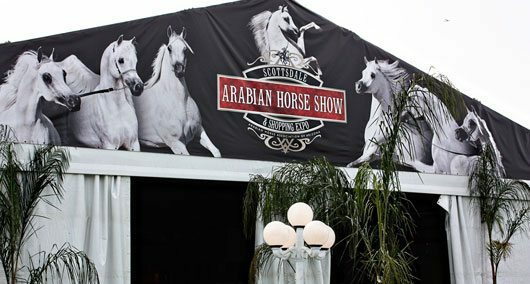 It’s held at the beautiful WestWorld facility and whether Arabians are your breed of choice or not, this show is a must-see if you’re in the area. This year, the 58th edition of the show will host more than 640 colorful classes, which will collectively pay out over $1 million dollars in prizes. Check back to my post in 2011 for a few photos and words about the show. From the tradeshow, to the stall fronts, to the many classes, It truly is an amazing show. One of the highlights of the show and a significant draw for western riders is the lucrative reining division. 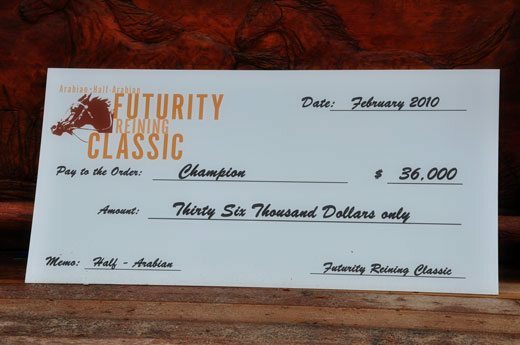 Watch for a Canadian representation in the Reining Futurity Classic, which offers a full and part-bred division and pays out $150,000. In addition there is a Non-Pro Derby and a Limited Futurity division. 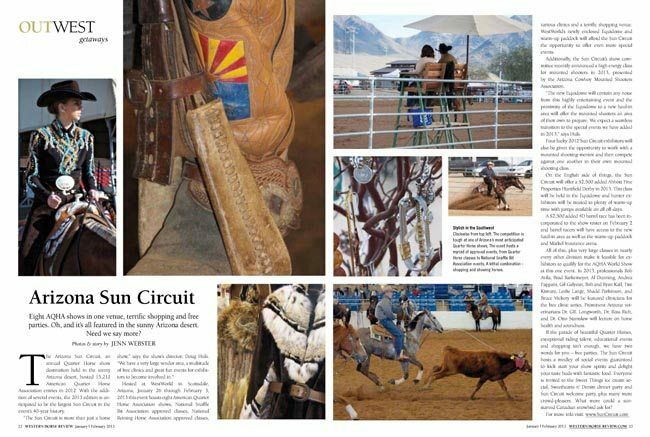 Currently ongoing and through to Feb. 3 is the Arizona Sun Circuit, a fantastic Quarter Horse circuit which we featured in our Getaways section of the Jan/Feb issue of the magazine, and I believe a number of Canadians are competing at as well. There’s a number of excellent free clinics over the course of this show, definitely worth the entry gate admission. 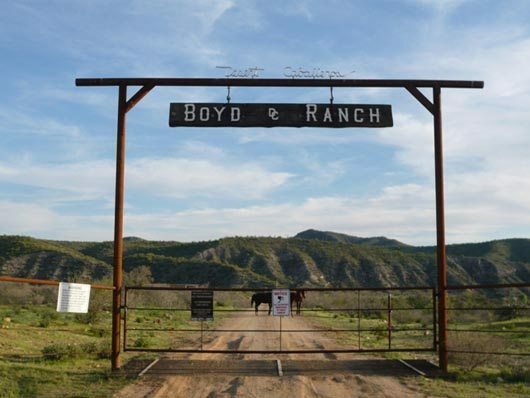 Still in January, western lore aficionados can meander down to Mesa, Arizona and take in the massive High Noon Western Americana Collectors Weekend, Jan. 26-27. 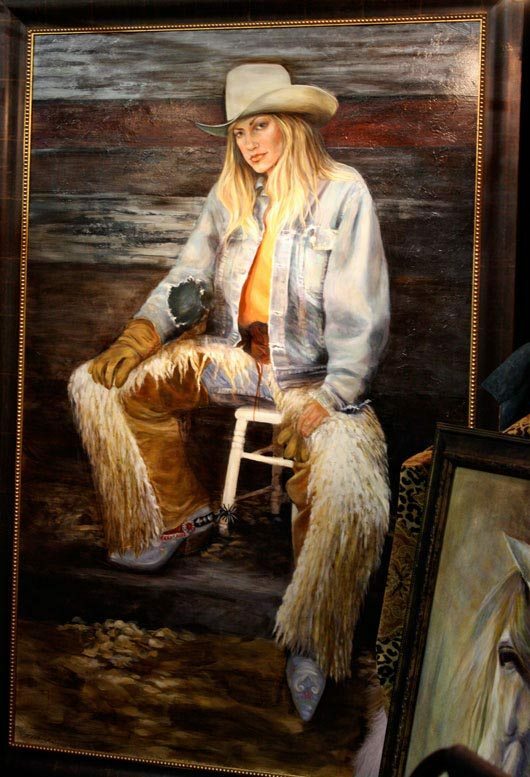 Covering all genres from antiques to cowboy chic, I’m guessing there will be interesting collections of both saddles and spurs, amongst other treasures. Fan of horsemanship and cow sorting? 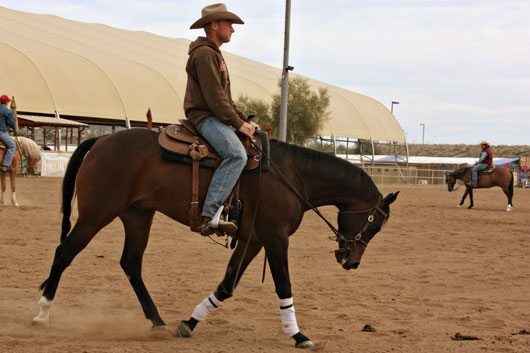 Trainer Paul Dietz is hosting a horsemanship clinic Jan. 26 and a cow working clinic Jan. 27 at his Desert Hills facility. Team sorting practice is every Sunday afternoon. Looking for something new to do with your horse for 2013. 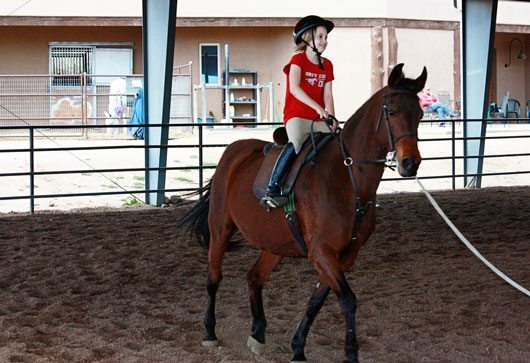 Western Dressage is taking off at Carefree Dressage in north Scottsdale. 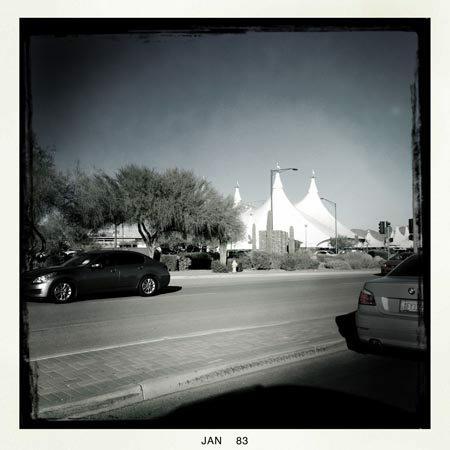 Finally, we’ve been driving by these tents on our sojourns into Scottsdale. If you happened to miss Cavalia when it was in Canada, I imagine experiencing it in the desert would be equally magnificent. 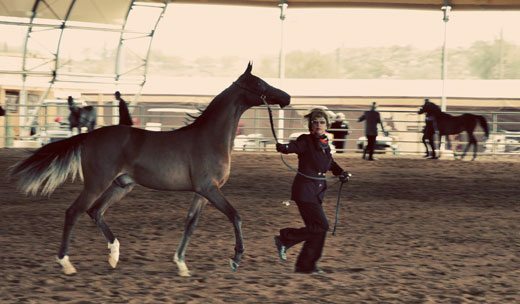 It’s running from now through to the end of Jan.
There’s a Blue Ribbon Horse Show Feb. 10 at the Arizona Horse Lovers Park. 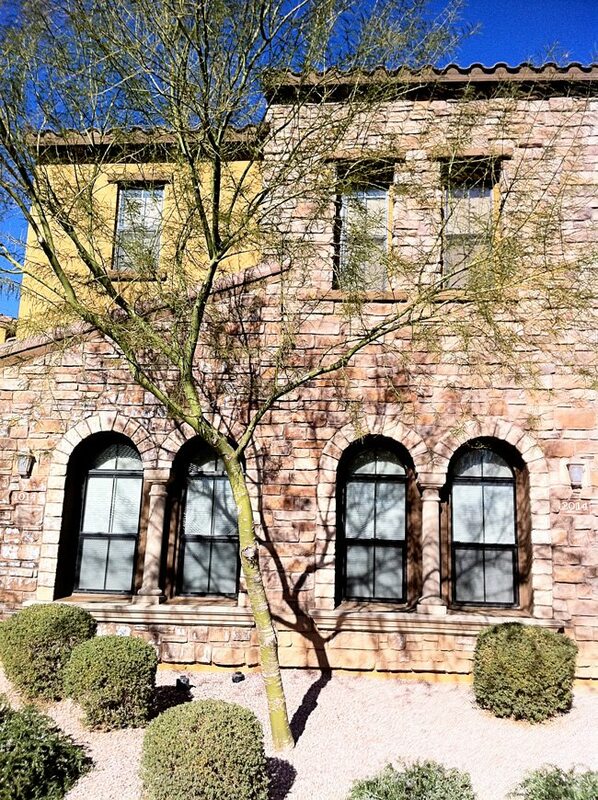 haven’t experienced the town of Wickenburg, their annual Gold Rush Days, Feb. 8-10, might be a good time to take a drive there. 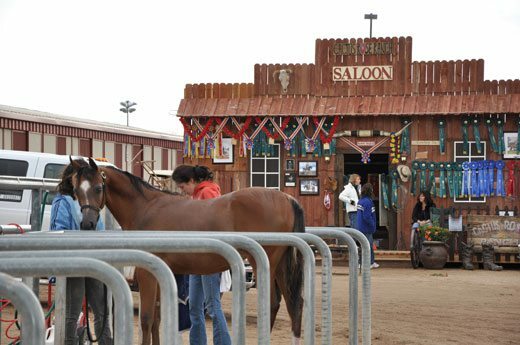 The town celebrates it’s ranching and gold-mining heritage with a parade, rodeo, dance, arts and of course, a staple of Arizona’s Wild West – gunfighter’s shootouts. 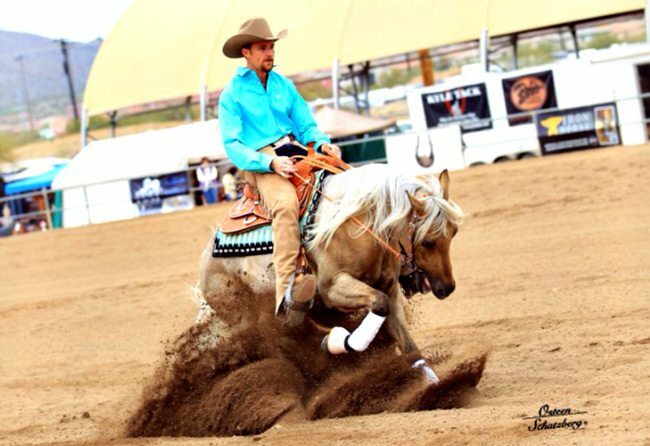 Dunn’s Arena, at Litchfield Park is a roper’s and sorter’s paradise with weekly events in both sports, as well as barrel racing. Check out the link for a full calendar of events. 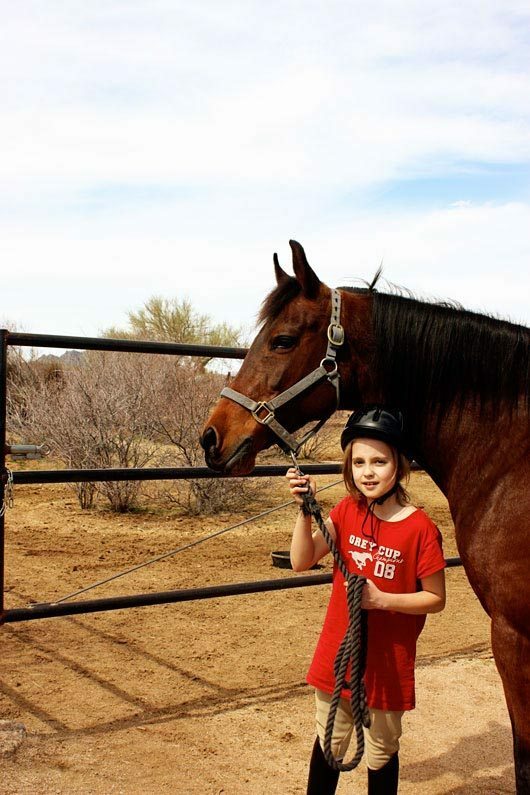 The Scottsdale Saddle Club, Arizona’s oldest and one of its most active saddle clubs, has a Western Show on Feb. 17, more details at the site. 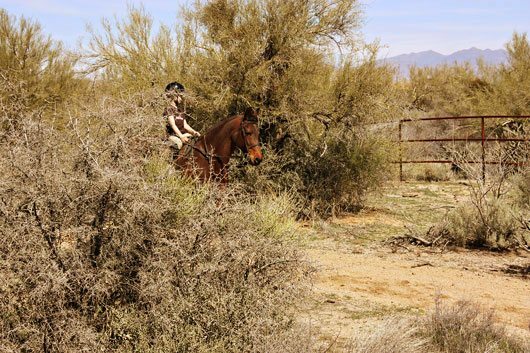 Cowboy mounted shooting offers up a vibrant culture in Arizona. Head down to the Ed Hooper arena in Casa Grande on Feb. 25-26 for what’s headlined as “not your Gramma’s shoot!” – The Gunfight in Arizona. In Germany, I happened to have a chance to attend a medieval jousting festival. Held on ancient castle grounds, it was a completely unexpected and fascinating side trip, learning and experiencing this vibrant equine sub-culture, which exists surrounding the Middle Ages and the sport of jousting. Arizona also has it’s own Renaissance Festival. 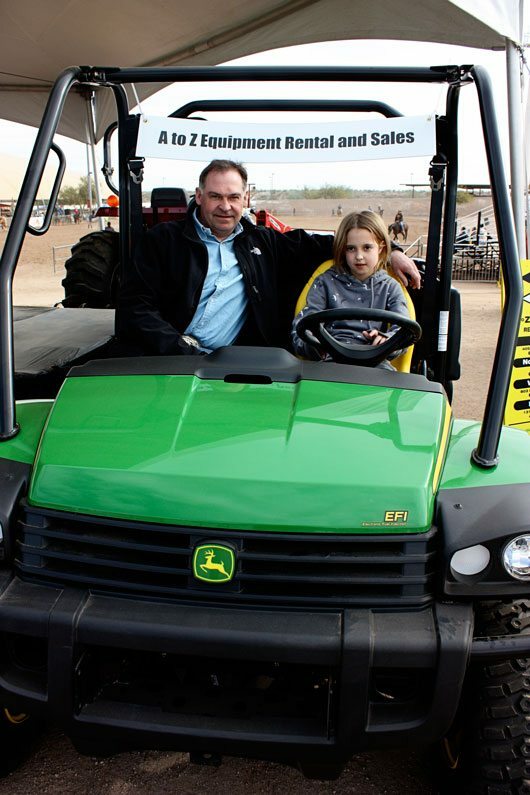 It runs every Saturday and Sunday from Feb. 9 to March 31, held near Apache Junction. Finally, this year’s Carefree Indian Market and Cultural Festival, Jan. 25-27, features a rich display of native American art, music and dance. I've been back for a month, but I'm still reliving Arizona riding. 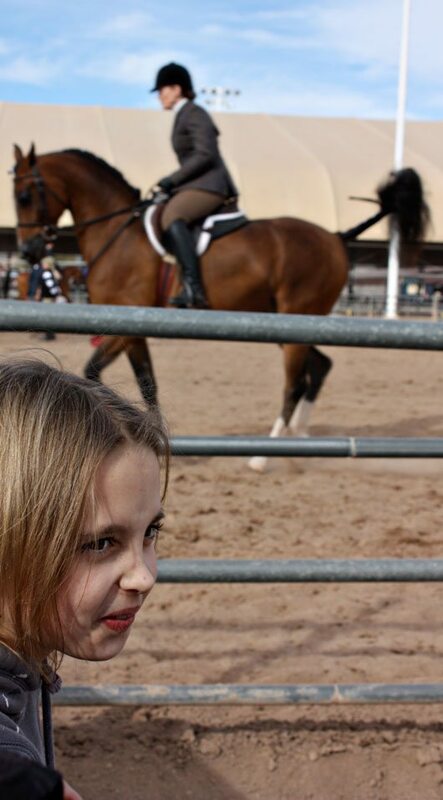 Among many other firsts of Arizona this year, I had the chance to experience the Scottsdale Arabian Show. Economically, Phoenix may be one of the most depressed regions in the United States, but you wouldn't know it at this show. 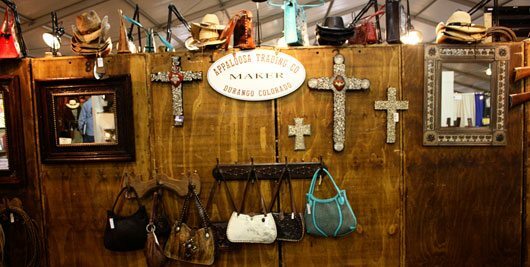 Our first stop was the Shopping Expo, where I ran into a jewelry and hat designer I had met a few years ago in Ogden, Utah. She related this is her favourite tradeshow nowadays. And, I could see why. The halls were packed. 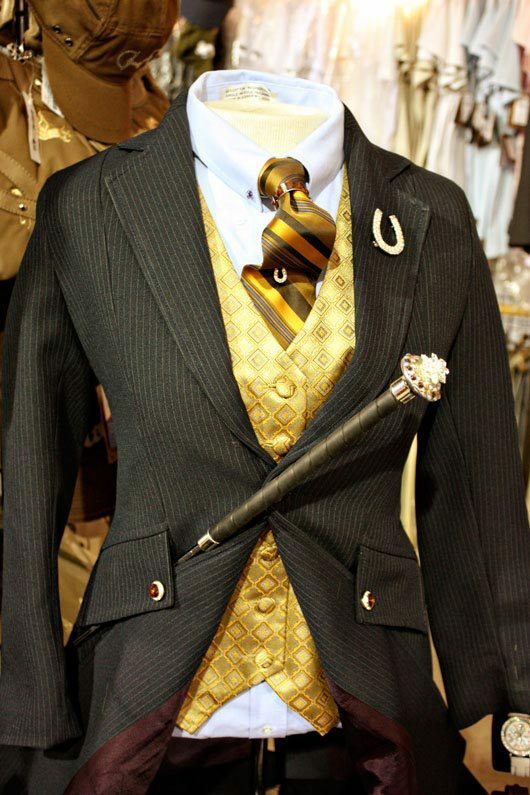 Gorgeous suits. 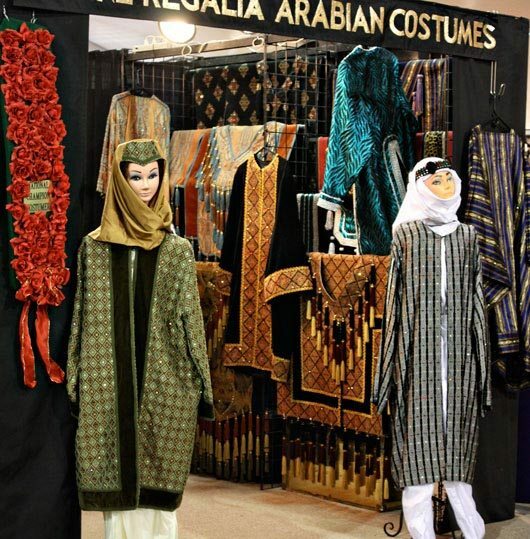 I”m asking my family to purchase me an Arabian, just so I can wear one of these. Lovely. Wee was taken by a booth filled with toy-horse size Arabian statues. Then it was off to watch the classes. If you ever have the opportunity to watch an English Country Pleasure class, seize the moment. It's really something. 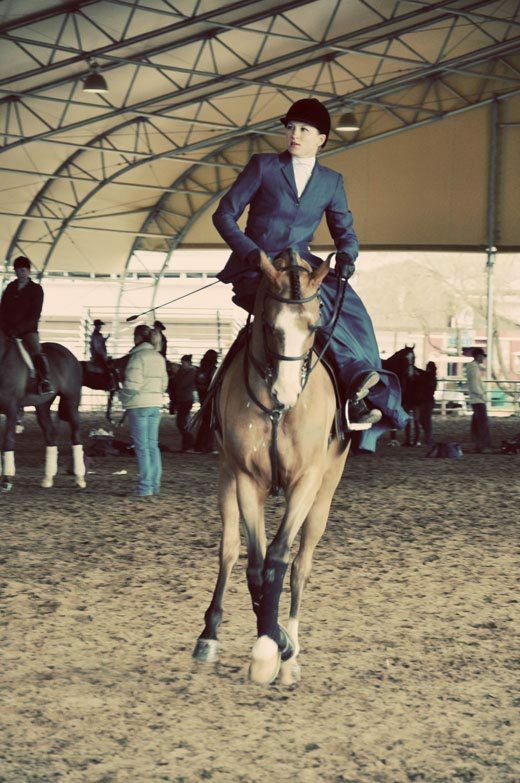 The smoothness of the gait, the fluidity of horse and rider. Outside, there was so much going on. Barns were showcasing their best prospects. 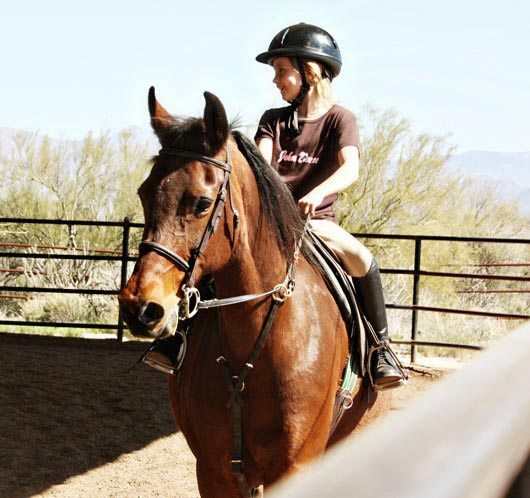 More classes – such as western pleasure. 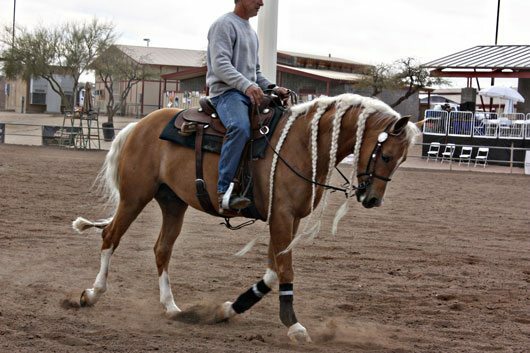 An incredible mane in the reining practice pen. 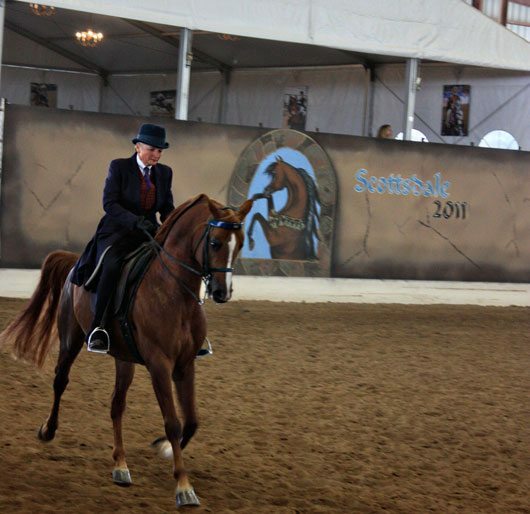 The Scottsdale Arabian Show hosts a fantastic reining and cow horse segment to the show. 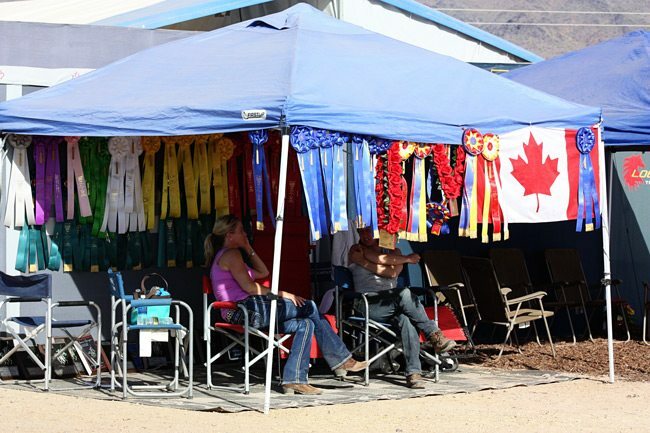 The purses are large enough to attract a yearly exodus of Canadian competitors specifically for these classes. And, often, we bring it on home! 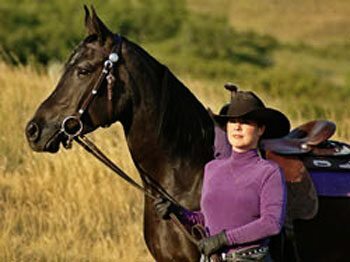 Watch for a story of several such competitors in our May and Summer issues of Western Horse Review. Outside, at the trade fair, we looked at barns – most of which would be hopeless in our Canadian winters. But, hey, we dreamed. It's what we do. What's that saying. . . “you can take the farmer away from the farm, but you can't take the farm out of the. .? lead a farmer to the farm equipment booth?” Ah, whatever. . . if you are acquainted with a farmer or two, you know EXACTLY what I'm gettin' at. They ALWAYS gravitate to the logo's they know and love. 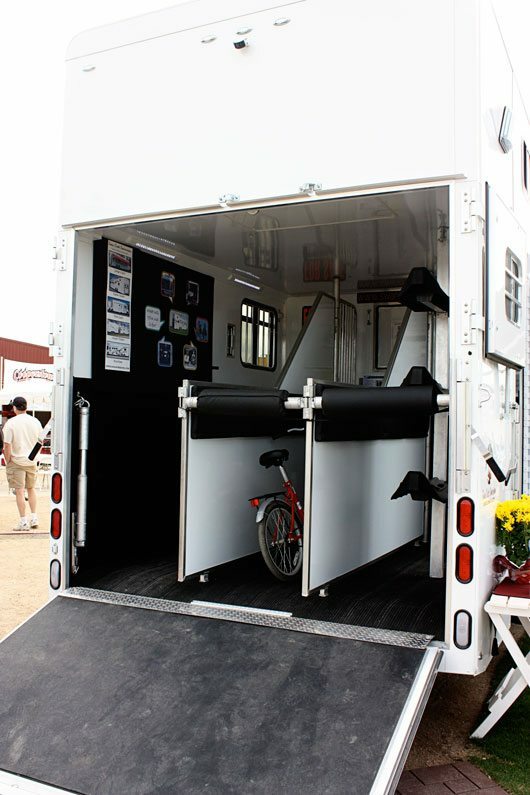 Naturally, there was a long line of trailer manufacturers, showcasing the latest equine travel modes. The three of us could see ourselves in this one. . . the freightliner connects to the . . . luxury living quarters connects to the . . .
three-horse accommodations in the back . . . yeah! We're coming back for this when we win the lottery. We interrupt this show coverage to bring you some exciting celebrity news. 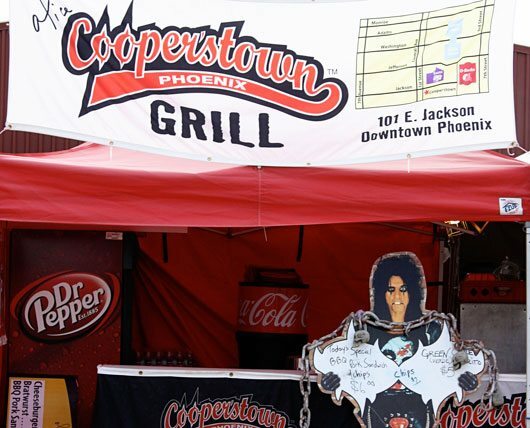 Alice Cooper has moved to Phoenix! And, had a food concession at the show. You heard it all right here, at Screen Doors & Saddles. Throw out your People magazine. You have me now. Alice, you might want to hang the menu on the lefthand side of your booth. It's hard to read at that angle. Just sayin'. . . Apparently, Alice is also a crack golfer and great conversationalist. Next year I hope to meet him. 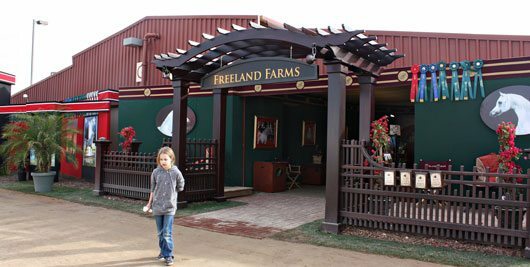 The barn and stall fronts at the show are nothing short of incredible, and we could have easily spent an afternoon perusing them. But eventually, even Wee tires of the horse show. In her own unique fashion. Although, she later pointed out she had lasted longer than at “your cutting shows.” Good point, kid. 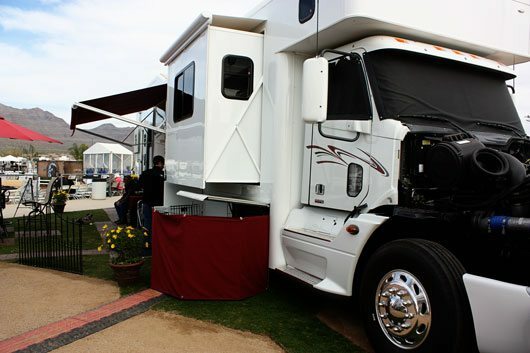 Hope you enjoyed this look at the 2011 Scottsdale Arabian Show. Thanks for tuning in and let us know if you attended, what you loved, and, if you found Alice. We're paying big bucks for paparazzi shots. I MUST let you know, if you haven’t already heard, and if you happen to be wondering why Jenn of My Stable Life hasn’t posted for the past couple of days, it is because she was busy birthing her babies! Yes, two wonderful, sweet, adorable, gorgeous babies, I might add. Congratulations Clay and Jenn! Eight weeks early, but I’m happy to report babies and Mom are doing fine. We can’t wait to see the next post on My Stable Life, but in the meantime, I think we might have to give her a couple of days off. 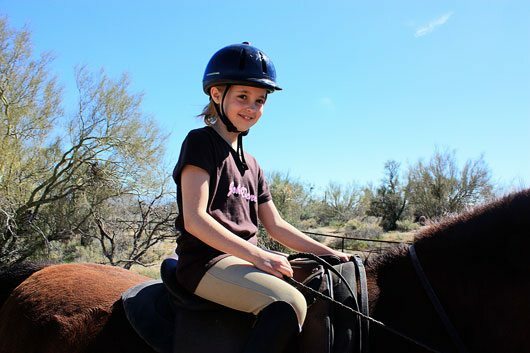 A few weeks ago, we were in Arizona, enjoying the warm weather, and spring riding in the desert. 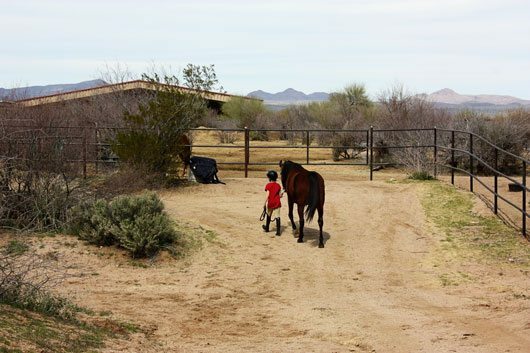 Each morning, Wee donned her riding boots and helmet and walked next door to a beautiful Arabian ranch for her riding lesson. Note to my Saskatchewan friends: I cannot account for the t-shirt this child is wearing. This photo just reminded me of it, and I’m searching through dirty laundry for it as I type. I think the kid hid it. 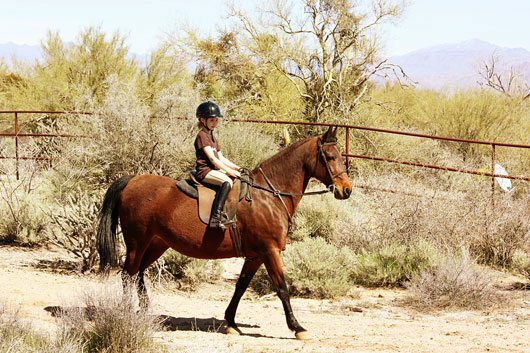 During this set of lessons, Wee rode English, and made the leap from trot to lope on her good mentor, Colleen. I think I’ve already related how I love Colleen. 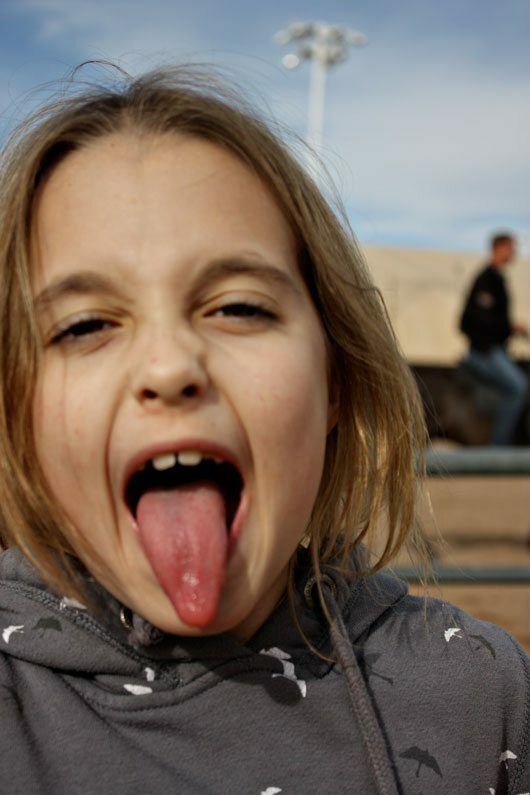 All horses have an inner beauty, but some are particularly kind to children, aren’t they. In between lessons, I chatted with Wee’s instructor, Alicia, and we agreed it would be great to time our next visit to Arizona prior to a schooling show, so Wee could finally (in my mind), show Colleen. It hadn’t occurred to me that riding every morning with Alicia is all Wee really wants right now. Later, when Alicia related to me that with each visit Wee was coming out of her shell, chatting more, telling jokes, and even lightly teasing Alicia and playing small practical jokes, I realized Wee was moving on, in her own way. While I wasn’t paying attention, Wee was developing her relationship with both Colleen and Alicia. Apparently, it wasn’t all diagonals and round and round. That, combined with Alicia’s regular praises of a job well done, as Wee’s riding improved, made her happy as a clam. I done believe I got a little insight from a little kid that day. Naturally, none of this would have transpired, were it not for Alicia, a wonderful, talented coach, who has had a beautiful influence on Wee. And, we can find her right next door. As opposed to 50 miles away. I think I’ve died and gone to heaven. On her final two days, after each lesson, Alicia allowed Wee to take Colleen on a short trail ride along a cleared path through the property. 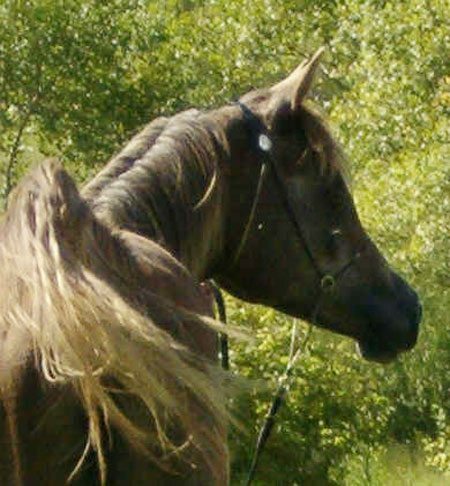 By the way, if you’re wondering, Colleen is a gaited horse breed, mixed with Arabian. She’s wonderful. I love her. Did I say that already? I followed along to take photos, while Wee pointed out the unique flora and fauna of the Sonoran desert, an environment we have both become enchanted with. The brush Colleen and Wee appear to be bursting out of is called Cat’s Claw, I believe. It’s a serious plant. Ask my jeans, they’ve been cat-claw distressed. I love how little kids dismount. Little legs and dangling feet. Till next time, Colleen, so long. . . 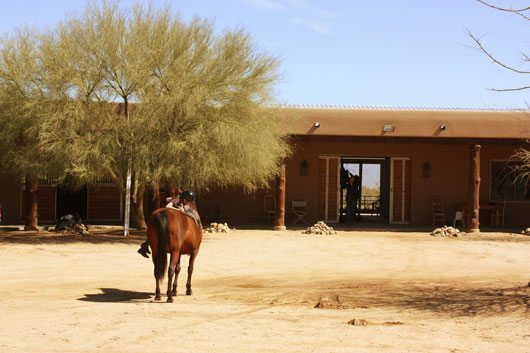 Thanks for checking into Screen Doors & Saddles today, and have a wonderful weekend! Did you know that according to Archbishop James Ussher, prelate of Ireland, the world was created on Saturday, October 9, 4004 B.C.E? Did you also know that the Arabian horse is the world’s oldest purebred animal? 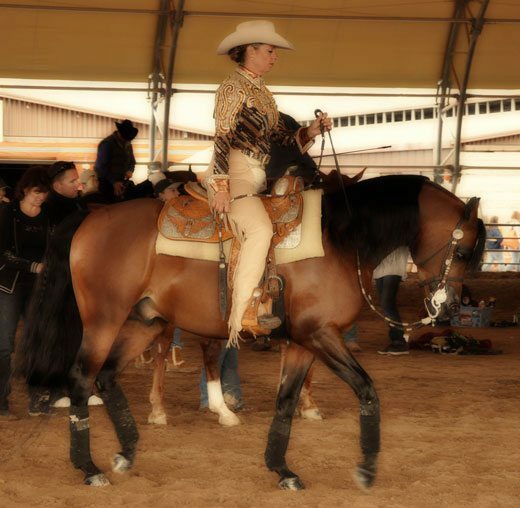 But I learned them both after attending the 2010 Scottsdale Arabian Horse Show. Held this past February 11-21, the show celebrated its 55th Anniversary this year. 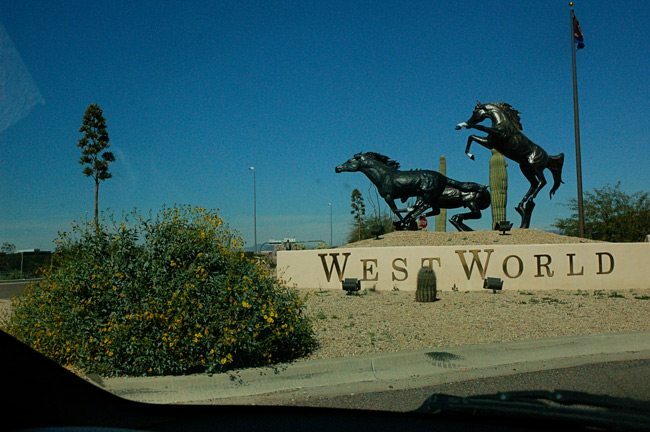 Granted there were several wet days – it was a rainy February for the Scottsdale, AZ, but host facility, Westworld Park is equipped to handle all kinds of weather. And there was no denying, Arabian horses attending this event were turned out in high glam fashion. So I thought I would share a few pictures that I snapped at the event. 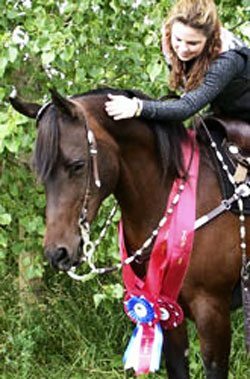 Once again, the show featured an Arabian and Half-Arabian Reining Futurity Classic and a Platinum Performance Liberty Class. 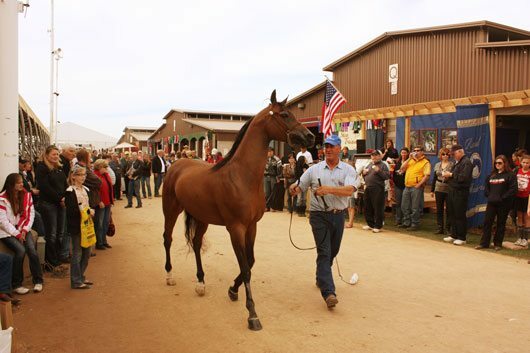 And the Scottsdale Arabian Show brings in excess of $33 Million to the local economy during its ten-day stint. 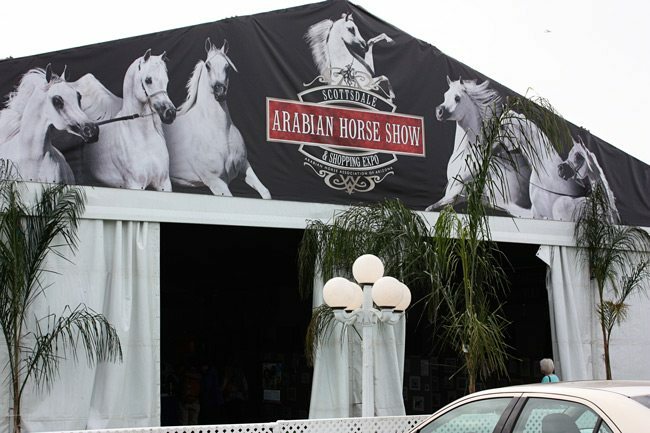 Statistically, the Arabian horse public outspends other area visitors two to one, during the show. And total prize money awarded to competitors, who come from every state and more than a dozen countries around the world, is over $1 Million. 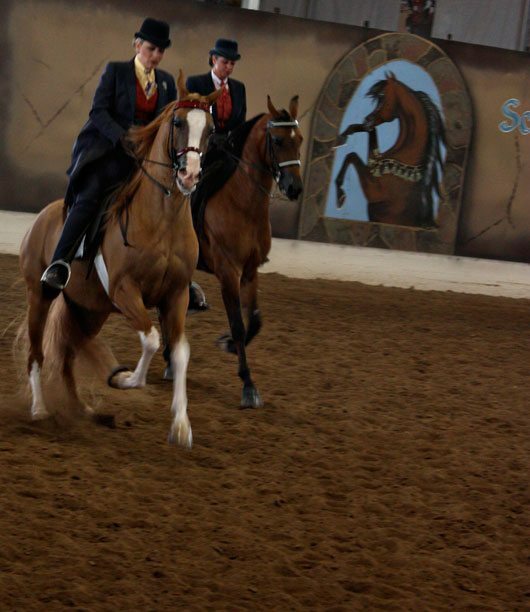 From yearlings in halter, to costume classes, to sidesaddle to reining events, this show has it all. 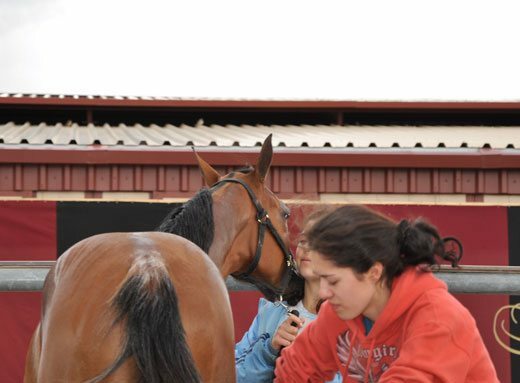 And it’s definitely a place to go if you want to see beautiful and talented horses.